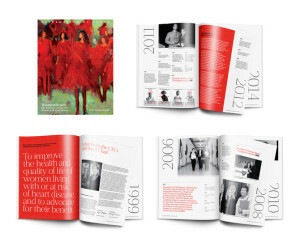 To create an annual report that also celebrated the organization’s 15th anniversary. WCM created a commemorative 24-page publication with a timeline that took the reader on a journey through the 15-year history of the organization. Integrating design, photography and content that seamlessly worked together, WCM balanced anniversary content with the requirements of an annual report by using sidebars to highlight milestone accomplishments and interspersing poignant quotes throughout the publication for a dramatic effect. WCM worked with the client to write and edit the content, reproduced all images in black and white to compensate for poor image quality and give a consistent feel to the report. The finished piece was a striking, bold, and informative report that doubles as marketing collateral.